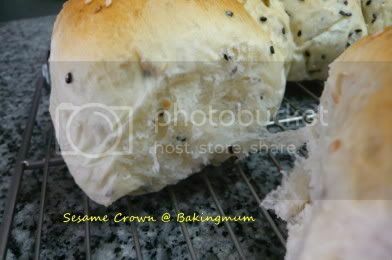 Baked some seseame crown this morning. 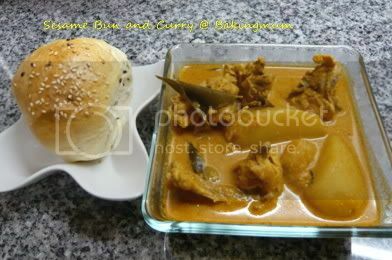 Wanted to eat it with the curry that I have cooked. 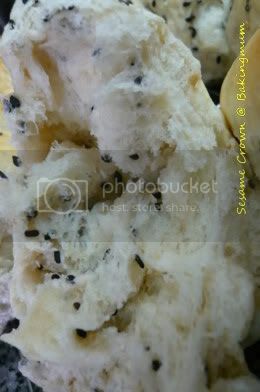 Hope the children will like this bread since there is so much sesame in it. This bread is crusty on the outside and soft on the inside. 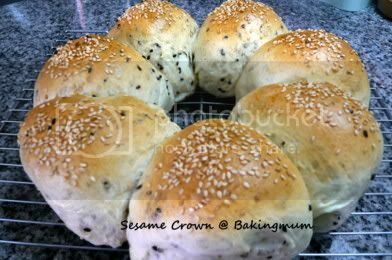 I did one recipe and got a big and a small sesame crown. 1. Combine ingredients A in a mixer. Mix lightly before adding in ingredient B. Beat until a dough is formed. Add in ingredient C and beat until dough is smooth and has an elastic touch. Add in ingredient D and mix well. 2. Keep the dough in a big bowl, covered with a damp cloth. Leave to rise in a warm place for 40 minutes or until double in size. 3. Divide dough into 10 portions, shape into small balls. Glaze with egg wash and top on some white sesame seeds. 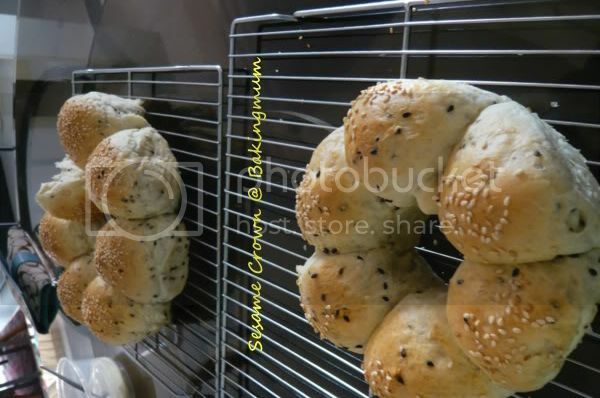 Place dough balls next to one another, using two chiffon cake moulds. Leave to proof covered for 45 minutes till double in size. 4. Bake in preheated oven at 180C for 20 to 25 minutes till golden brown. Remove from mould immediately and cool on a wire rack. Hi, your Sesame Crown looks delicious. Do you mind posting the recipe? I just baked some bread yst, but it doesnt turn out. The dough seems too drying. The outer bread was hard but the inner was quite soft. Have used dry baker's yeast. Is there any difference between dry baker's yeast and instant yeast? 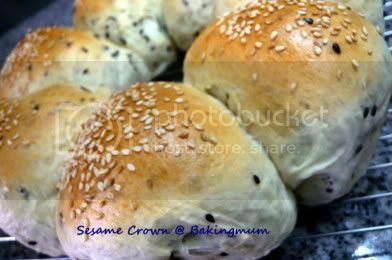 your sesame bun look soft and moist!!yum-yum! Sorry to trouble you again. Do you think it's possible to do knead by hand instead of mixer? I am looking for good oven. Mind sharing me the brand and model of your oven or give ur recommendation? Is it ok to leave it to proof either the 1st or 2nd proof overnight? Thot of making the dough at night and only bake it next morning. Hi family first, you can leave the dough to proof in the fridge and bake it the next day. Next day take out the dough and let it thaw out a little and shape and proof again then bake.